Nyepi is the Balinese New Years, silent day in Bali. All activity stopped. Large cities to villages that have been silent. Nyepi celebration consists of several rites performed ranging from a few days before Nyepi, until the day after Nyepi. Nyepi is derived from the word seeepi (silent). Nyepi is actually a celebration of the New Year based calendar of Caka. of Caka calendar began in 78 AD. 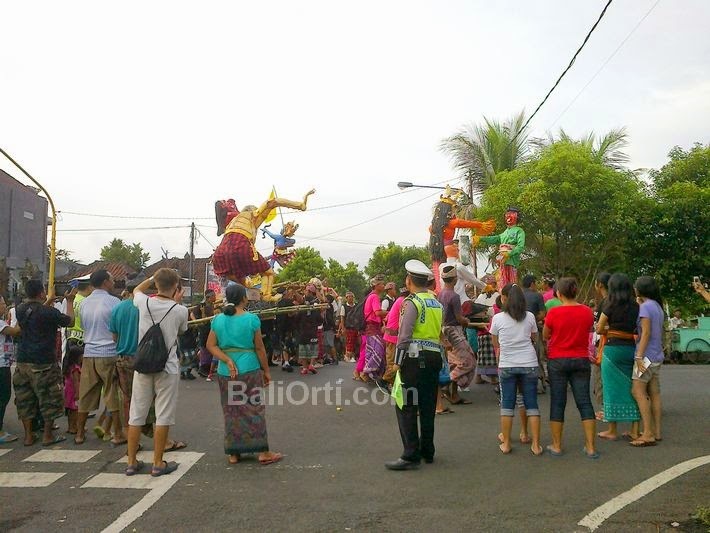 Unlike the New Year celebrations in general, Caka New Year in Bali began to retreat. No activity as usual. All activities were discontinued, including public services, such as International Airport was closed, but the hospital is not covered because it is associated with the interests of the emergency. Makiyis / Melasti performed between four or three days before Nyepi. Melasti Ritual is equipped with an assortment of offerings. Such offerings as a symbol of Trimurti, 3 gods in Hinduism, Vishnu, Shiva, and Brahma. And also paraded throne symbol of Brahma is "Jumpana". Melasti ceremony meaning that the cleaning process emotional and physical man and nature, by way of water washed away all the dirt using life. Therefore, prayer procession carried out in water sources. Implemented no later than mid-afternoon. The ceremony is also aimed begged Ida Sang Hyang Widhi Wasa that people are Hindus were given the power to carry out a series of Nyepi. Tawur Kesanga is pecaruan ceremony held on tilem kesanga, held each end of the year of Saka calendar, a day before Nyepi, namely the "tilem sasih kesanga" (9th dead months), Hindu ceremony of Buta Yadnya at all levels of society, from of each family, villages, districts, and so on, by taking one of the types caru (sort of offerings) according to his ability. Tawur or pecaruan a ceremony to make Buta Kala (demons) became quieter, and all the negative influences (soiling), expected all the negative influences in life and this world can disappear. Mecaru followed by pengerupukan ceremony, which is spread-spread tawur rice, lit a torch in the yard of the house, rang the firecrackers, and hitting any objects (usually gong) to create the atmosphere and sounds crowded / noisy. This stage is to expel of Buta Kala (demons) from the home environment, yard, and the surrounding environment. In Bali, pengrupukan usually enlivened with ogoh-ogoh. Ogoh-ogoh embodies of Buta Kala (demons) who paraded around the village, and then burned. The goal is to expel of Buta Kala from the surrounding environment, so that when the Nyepi Day has a clean environment from negative influences. It is the culmination of the celebration of Nyepi in Bali. Started at 06:00 AM on March 21, until 06:00 am on March 22, 2015, the entire people in Bali are not allowed to leave the house, not to be spoken out loud, may not use the vehicle on public roads. 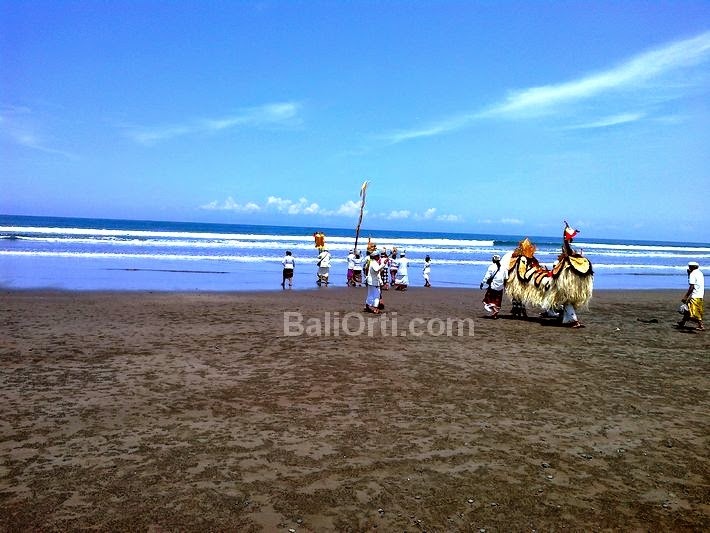 Foreign tourists who were in Bali also have to comply with all customs regulations in Bali. At the time of Nyepi Day, Bali's airport closed for 24 hours. No flights from and to Bali. At the time of Nyepi Day, Bali's Ngurah Rai Airport is the only airport in the world that was closed for 24 hours. 4. March 22, 2015, Ngembak Geni Day. Ngembak Geni Day is the end of Nyepi Day. When the day, everyone can work as usual. People have been halted since morning activity. All family and relatives visit each other, greetings and devout forgive. Usually when Ngembak Geni Day, people relax into tourist attractions.